Sinyati is a 45 year old mother of 6. 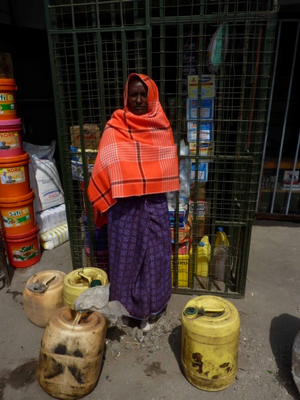 She was given a grant to buy kerosene, which she sells outside the market in Ngaramtoni. She was sometimes chased away from this spot so has learned to wait until 1 pm before going to sell. Despite the shorter working hours, she says she is doing very well. At the moment she sells on just 2 days a week when the big market is operating, but has plans to add more days in future. She lives in her own house and is very happy that she can now meet the needs of her family. She has one child in secondary school and two in primary school. She also has 3 children under 5. Her son helps her if she has any problems with her health. In addition to managing the children’s school expenses she says that they are now eating 3 meals a day. Before she started the business, they would just have tea in the mornings and would have to wait until evening before they could eat. If you would like to help support more women like Sinyati, we are currently raising funds for our next round of grants and loans. To help us achieve our target you can donate here.